I’ve been a huge fan of Betty Blues Loungerie forever, so I splurged on several pieces over this past summer. They’re just showing up for review now because it was just too hot here to think about satin robes and loungewear until recently. This piece is sold out at Betty Blues currently, but you can still find it on sale here at Violet’s Knickers and other online retailers. Some of the matching pajama sets are still in the sale here at Betty Blues as well. The sleeves on this robe are beautiful, although the cuffs are a bit large on my wrist. As you can see, the fabric has a lovely drape that continues all the way down to the skirt of the robe. If you like vintage lingerie, this is pretty much heaven. I’m wearing an XL, which has plenty of room in it. The robe has an adjustable construction so you can wear it however you’re comfortable, as well as a nice long tie to accommodate a variety of sizes. The skirt of the robe is swishy and long, although it doesn’t drag and I’m 5’4″, so it may be a bit on the short side if you’re especially tall. Between this and the pajama set I picked up I’m now a huge fan of Betty Blues Loungerie, so I’m hoping to try some more pieces from them in the future. Have you tried any pieces by Betty Blues yet? 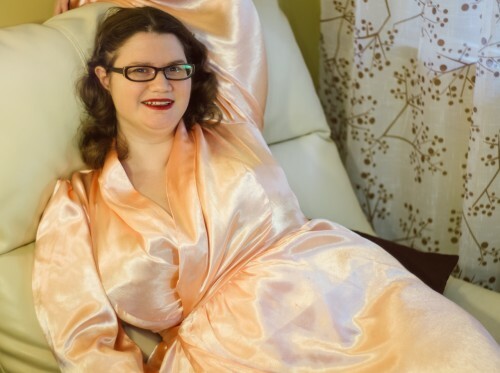 What do you think of this vintage inspired robe?